The Winter Issue of Babson Magazine featured alumni entrepreneurs tackling trash-related topics with their businesses. Bigbelly and founder Jim Poss were one of the featured companies. Walking on Charles Street in Boston, Jim Poss, MBA’03, noticed how every weekend the garbage cans were overflowing with trash. One day, as he watched a dump truck stop every 100 feet to empty the bins, idling and spewing black smoke as it started up again, an idea struck him. Why not compact the trash in the bin? Increased capacity would equal fewer pickups and less garbage truck fumes. With a background in the electric-vehicle and solar-power industries, Poss immediately convinced himself that a simple solar panel could power a small motor operating the compactor. He ran some numbers and decided, “I can do this.” A little research uncovered an industry that burns billions of gallons of diesel fuel each year. “It didn’t take much of a spreadsheet to figure out if you displace collection a couple of times a week, this could work,” says Poss. 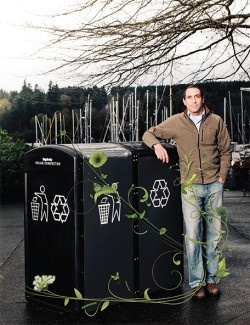 Thus began BigBelly Solar (originally Seahorse Power Co.), manufacturer of solar-powered, networked trash and recycling compactors. To solve the problem, Poss’ team developed a network and online management system that tells users when a can needs emptying. Compacting trash lowered collections; picking up only when necessary brings that number down even further. To round out its offerings, BigBelly added cans for recycling about four years ago and, just recently, cans for composting. Sustainability carries over into the production of BigBelly bins, as the cans are manufactured in the U.S. and their exteriors are made from recycled U.S. steel and plastics.